Known as “America’s Highway” and celebrated by author John Steinbeck as the “Mother Road,” the legendary Route 66 meandered across 2,448 miles of the fruited plain, crossing three time zones and eight states as it traversed from Chicago to Los Angeles. For many—especially destitute sharecroppers fleeing Oklahoma’s devastating Dust Bowl—Route 66 held the promise of a better life. For others, Route 66 brought a sense of connectedness with parts of America previously considered difficult to reach. For them, Route 66 engendered a frontier spirit of adventure, greatly expanding their vacation options and travel opportunities. For hundreds of communities strewn along the two-lane blacktop, Route 66 was also an engine of economic prosperity, creating tremendous opportunities for entrepreneurs large and small. The service industry fared especially well with roadhouses, motels and restaurants springing up, offering respite and sustenance to weary and hungry travelers. Since the halcyon days of Route 66, neon signage has been a prominent and vital part of the Mother Road as it winds through Albuquerque. From the foothills of the Sandias in the east to the parched desert expanse of the west, Route 66 is festooned with vibrant neon signage that cuts a luminous swath through the city. The nocturnal spectacle of glowing neon might be the siren’s call that has drawn generations of “cruisers” to the nostalgic route. One of the Route 66 corridor’s most popular neon-spangled destinations celebrates Route 66 in name and spirit. Even though Route 66 was decommissioned as a U.S. highway in 1984, a visit to Albuquerque’s 66 Diner takes you back in time to when Nat King Cole was singing about getting his kicks on the fabled highway. It will transport you back to the days of pony-tailed waitresses in blue skirts and bobby socks, back to when rock-and-roll was making inroads to ruling the airwaves, to when Ed Sullivan was nabbing all the top talent for his popular variety television show. With a jukebox full of hits, walls adorned with nostalgic black-and-white photographs and plenty of neon, the 66 Diner celebrates the era of Route 66 with aplomb, earning it an internationally known reputation. Hundreds of Pez dispensers line the ledges directly above the steely countertops in the front dining room. A black-and-white classic lunch counter calls to mind the ice cream fountain of yesteryear. There is much to like about the Route 66 the diner even if Route 66 the two-lane blacktop is solely something you’ve read about. You’ve got to admire the gumption of a restaurant willing to replace a recipe if a better one is brought in by a guest. That’s right! If you believe you have a tastier recipe for something, the 66 Diner will try it out and if they like it more, it will go on the menu. Not only that, they’ll treat you and three friends to dinner. Frankly, I have a feeling they haven’t had to comp many dinners. That’s because the 66 Diner’s recipes are tried and tested over time. The diner originally launched in 1987 in a converted World War II era Phillips 66 gas station named Sam’s. It was an instant hit among locals and tourists alike. In May, 1995, the 66 Diner went up in flames, only a portion of the original structure remaining. Albuquerque was in mourning for nearly seven months as the diner was rebuilt. It relaunched in February, 1996 and like the Phoenix of legend, has arisen from the ashes to reclaim its previous glory. Like many 1950s diners, the 66 Diner features a daily “blue plate special.” Ironically the term “blue plate special” originated not in the 1950s, but in the 1890s courtesy of the Fred Harvey restaurants along the railroad lines of the frontier west. I’ve written extensively in other reviews of Fred Harvey’s culinary contributions to the West. Like his other contributions, the genesis of the blue plate special is very interesting. Apparently Harvey bought cheap, disposable plates colored blue similar to Wedgwood dishes and used them to serve inexpensive meals, hence the term. At the 66 Diner, the blue plate specials range from spaghetti and meatballs on Monday to chicken pot pie on Tuesday, chicken and dumplings on Wednesday, a taco platter on Thursday, fried catfish on Friday, a hot turkey sandwich on Saturday and “mom’s choice” (whatever mom comes up with) on Sunday. For the most part, the blue plate specials are comfort food favorites prepared very well and served in generous portions. No ’50s-era diner would be complete without thick, rich milkshakes, floats and malts (egg creams are available, too). No one in Albuquerque does it any better. That’s the consensus of respondents to various annual polls of city diners who have voted the 66 Diner’s shakes “best in the city” consistently year after year. It’s unlikely, however, that you’d have been able to find a strawberry-lemonade or Mochaccino shake during the Route 66 era. The 66 Diner offers more than twenty different shake flavors. Many people eschew the old stand-bys–chocolate, vanilla and strawberry–in favor of flavors that weren’t available in the 1950s. In fact, some of those revolutionary flavors might have been considered heretical in the more conservative era of the 50s. Those flavors include the Elvis Presley (banana and peanut butter), the Pink Cadillac (strawberry ice cream and crushed Oreos), Oreo, Dreamsicle, Mocha, Coffee and several others. Pumpkin pie and Egg Nog shakes are featured as “shakes of the month” during winter holiday season. Despite all the inventiveness, the most popular shake remains chocolate. 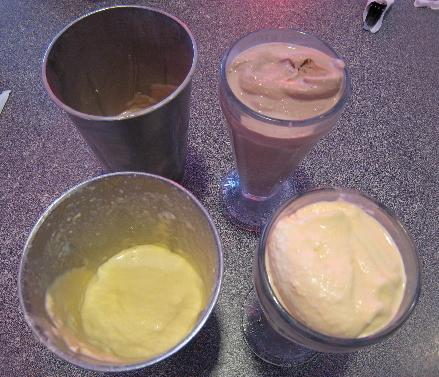 Unique flavors not withstanding, the 66 Diner’s milkshakes are made with real hand-dipped ice cream and whole milk and are mixed in a tin on a Hamilton Beach blender, the way they were made in the 50s. They’re then served in a shake glass with the tin on the side, much like getting a shake and a half. The 66 Diner is also one of the few places in town to offer red cream soda, my favorite before I gave up sodas altogether. 25 June 2011: Nothing goes better with a shake, float or malt than a burger. In New Mexico, naturally this means a green chile cheeseburger. The 66 Diner makes one of the very best (top ten) green chile cheeseburgers in town–even though it didn’t made the New Mexico Green Chile Cheeseburger Trail in either 2009 or 2011. When you request a burger a certain way, it’s delivered to your exacting specifications. Moreover you get a two-fisted burger in which the beef is prepared to your exacting specifications, the ingredients are unfailingly fresh and the chile (spelled correctly on the menu) actually bites back. It’s a very good chopped green chile with piquancy and flavor. Burgers are accompanied by your choice of sides–French fries, potato chips, coleslaw or potato salad. 28 June 2014: There are probably only a handful of Duke City restaurants deigning to serve a Sloppy Joe sandwich today. While the Sloppy Joe wasn’t “invented” during the Route 66 era, its peak in popularity occurred during that time. The Food Timeline Web site explains how the name Sloppy Joe came about: “There is probably no Joe after whom it is named–but its rather messy appearance and tendency to drip off plate or roll makes “sloppy” an adequate description, and “Joe” is an American name of proletarian character and unassailable genuineness.” At its most basic, the Sloppy Joe is a simple sandwich constructed with ground beef and a tomato sauce to which salt, pepper and spices are added. At its elevated form, it’s sandwich deliciousness you will crave. Route 66’s Sloppy Joe will inspire craving. 28 June 2014: Contrary to cynics who decry the patty melt as nothing but a “cheeseburger served on toast instead of a bun,” a patty melt—when made well—can be a transformative sandwich constructed from a high-quality ground beef patty topped with molten cheese and grilled onions on rye bread pan-fried in butter. The 66 Diner may prepare the very best patty melt in town. Perhaps that’s because the patty melt actually originated in the Route 66 era. Every element of this sandwich is absolutely textbook perfect, the way every patty melt should be made. All sandwiches are served with your choice of French fries, potato chips, potato salad or coleslaw. For a pittance more, you can substitute onion rings, Cheddar fries, Fiesta fries, okra or a dinner salad. The onion rings are worth the splurge. They’re lightly battered and golden-hued, sheathing a sweet onion. The potato chips are crisp and whole, not annoying bottom-of-the-bag bits and crumbs. The 66 Diner isn’t as well known for breakfast as perhaps it should be. Its limited breakfast menu might be the reason. Frankly, many New Mexicans are of the opinion that if you have breakfast burritos on the menu, you don’t need much else. 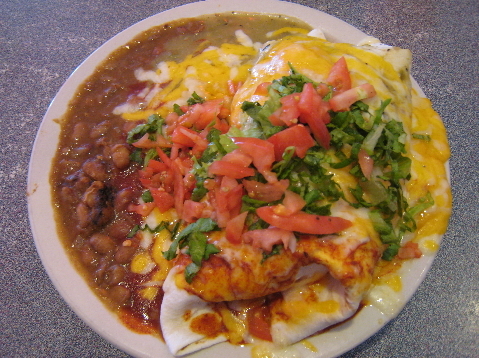 The diner’s breakfast burrito is one of the biggest in the city, a large tortilla engorged with home fries, scrambled eggs and chopped green chile topped with melted Cheddar cheese and your choice of red and (or) green chile. 12 October 2008: Make yours “Christmas style,” a burrito covered with both red and green chile. Both are surprisingly good and more piquant than at many New Mexican food restaurants. In fact, the green chile is downright special, a fruity sweet and incendiary chile that elicits the type of endorphin rush which makes people fall in love with chile in the first place. The burrito is served with pinto beans. 12 October 2008: On our way to the 66 Diner for breakfast one Sunday, we passed a restaurant on Central Avenue offering “all you can eat pancakes for seven dollars.” A better bet would be ordering a “short stack” at the 66 Diner. Short obviously isn’t synonymous with small as we found out when our waitress delivered two pancakes which covered all but a tiny bit of the plate. These enormous pancakes would fill a small, developing nation (or as Jay Leno might quip, one fat American). We barely put a dent on them and even contemplated the notion of left-over pancakes, but perhaps only if you’re stoned would pancake left-overs be palatable…and they might cure the munchies. Otherwise, they’re almost inedible. 13 December 2017: My friend Bruce “Sr. Plata” Silver is as California as a surfer girl or an In & Out Burger, but as much as he loves chicken fried steak, you’d think he was from Texas. When we make plans to meet for breakfast or lunch, one of us is invariably “low-carbing” it. Healthy eating be damned when one of us suggests chicken fried steak. It’s a choice we always agree upon. In our two-man quest to traverse the length and breadth of the New Mexico chicken fried steak trail, it surprised me to learn he’d never tried the Route 66 Diner’s version. He quickly discovered what generations have known–that the tenderized slab of breaded steak on his plate is roughly the size of Danny DeVito. Seriously! It’s one large slab. As always, Sr. Plata didn’t settle for for only the house gravy (a meatless brown). He also requested a side of the con queso. He then slathered the slab with a sinful portion of both–not gravy on one side and queso on the other, but both intermixed. It was a delicious choice! 13 December 2017: While Sr. Plata enjoys chicken fried steak best, my preference is for chicken fried steak, a redundantly named dish which Serious Eats calls “country cooking at its most comforting.” This is one chicken dish about which any pretensions about chicken being a healthier alternative to beef go out the window. There’s not much healthiness in the tender, juicy hunk of tenderized and breaded chicken. Add queso and you can virtually feel your arteries hardening with every bite. What a way to go! Friendly, attentive service is also a constant. There are many who say nothing could be finer than a meal at the 66 Diner. They’re right! Gil, don’t forget to give Hermano Del Sr Plata (aka my big brother) a call/email when you are in my state of origin! If he happens to be there, he will welcome you and join you in some delicious meal on yours/his scrumptious list. Wish we could bring the 66 Diner to California, this place was really really good!!! Absolutely! We look forward to meeting Loren. Once again, Sr Gil got my good side in the pictures, they make it seem like I have Food on the Brain… I do. 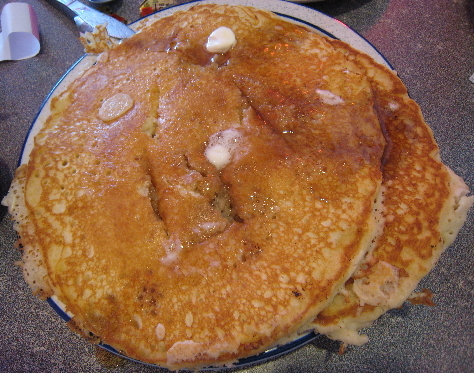 Short note, I looked at the picture of the pancakes above from an earlier time and I must admit, I wish I could reach out to them and eat them, with melted butter poured over and then a plentiful amount of maple syrup. Pancakes and Chicken Fried Steak are 2 of my favorite foods that bring great comfort to me. I would tell my Dad back when how much I loved it and he would laugh and say how chicken fried steak was a people for those that couldn’t afford steak during the Depression (Beef Ribs as well…). Interesting segway to what I ordered, you can see that above as well. 1st, it was one of the best Chicken Fried Steaks I have had in this State (of course I say that each time I try it with my Friend Gil. But this, not an abundant amount of flour, a great amount of steak (in fact a very large piece) cooked to a golden brown, absolutely beautiful, just simply melted in my mouth ( hmmm, instead of Chicken and Waffles, how about Chicken Fried Steak and Pancakes, now that would be a Treat!). And of course, I can never make up my mind on toppings so I had to have the brown gravy (vegetarian) and the the quest with Chile (just reread Gil’s description of my meal and realize what I just wrote doesn’t do justice (yes, I slathered!). I must admit combining both is the only way to go (okay, its one of many ways, you could also get the white gravy). Anyways, this was my first time here and it was really really good and again will want to come back. I told Gil, the only way to do this right was to take a day, go to the best Chicken Fried Steak (and Pancakes) and have a blindfold taste test, I have the strange feeling it will be a tie which is a big shout out to the great Restaurants of the Land of Enchantment… Gil, where next do we go???? While I question its authenticity as a “vestige” of Route 66, e.g. I don’t think Steinbeck or Okie’s ever stopped there, I say Bravo to it’s attempt to be that which was here in ABQ as Route 66! ….and I stand to be corrected. (Alas don’t know its “circa”, but I did enjoy the hole-in-the-wall bar named “Okies” at Rte 66 and University back in the day with its one Johned toilette! as well as Rt 66’s Jokers pub just west of there where this novel http://tinyurl.com/y7mjt49l started out in or at!) Elsewise, I’ll give real Homage to Lindy’s downtown, and the Western View Steakhouse ‘way out’ west Central and, of course, to my admitted Fav, The Dog House, as epitomizing the original Route 66 eateries… IMHO. by I-40, like Peach Springs, Seligman, Ash Fork, Williams, Winslow (where you can still stop to Take it Easy http://tinyurl.com/nwybnh6 while snapping a pic http://tinyurl.com/ybfnosld), Joseph City, Holbrook and its concrete Wigwam Motel, to Gallup (for 40-50 autographed pics of the likes of Big John, Ronnie, Liz, Chester Riley et al e.g. https://www.youtube.com/watch?v=ICaBGgFxKx0) on to Milan/Grants and the sight that lured me down into this bejeweled valley http://tinyurl.com/y8pzd6na circa ’68. – As noted, I’ll give a Kudos to their Sloppy Joes con chips! I never had that till ’59 when my RoomMate…Bruce….made ’em from scratch to include onion, bell peppers, assorted spices, tomato pastes, for the sauted hamburg on a bun that ya ate with a knife and fork!!!! I’ll echo my 6/11 Comment for the sake of interim reliability. In addition, and in all fairness to the gal waitstaff, I must note that while Folks have given the retro tiles/wall decor/pezs/spinning counter stools/etc their due, they have noticeably ignored “the justice” the Galz and also what they do for the pert uniforms of olden times bring to the overall ambiance of the place! Seriously? picture them in coveralls!!! I’ve forgotten this diner is here unless I have a reason to visit the downtown hospitals; dumb, dumb me. Unfortunately, but luckily, I had to go to one of the hospitals over Christmas weekend. I had a late lunch and it was diner perfect. A previous commentator asked, ‘What about the Pile-Up?’ This truly is tops on my list of sloppy, tasty New Mexican breakfasts. The papas were silver dollar sized chunks of moist, skin-on deep fried potato bliss. The bacon was perfectly salty. I ordered Christmas style, duh?, and the red and green complimented perfectly. I must say their green chile is really a lot of actual chile. Nickel size slabs of chile in just a little bit of sauce. So many other places use a mostly corn-starched yellow gravy with bits of green chile, not @ 66. The eggs were as ordered of over medium which, when cut into, soaked into the papas like caramel. I have to add that there are popular places in ABQ that boast a “Pile of Papas”. Not even close to the 66 as they use frozen hash browns or frozen french fries. The final product is bland. I”ll also add what great service I had. Restaurants near a college campus will staff with the local work-force. Often lately those being bored, put-upon and sullen. The waitress I had was a pleasant blond girl named Jenny. Service was timed perfectly, not just to my table. She knew the menu; I heard her more than once list side options, bread choices, substitutions and milk-shake flavors as if she owned the place. Well done. She may very well be going to college to major in aerospace but until then she treats her customers like a throw-back 1950’s server in the Route 66 experience. It’s a little like winning a prize when the shake comes with the extra few gulps in the mixing container. And for the record I’ll take a good vanilla shake first and then a good chocolate shake second, everything else is a distant third. Route 66 Diner takes me back to the luncheonettes in the east I went to as a kid growing up. We may not be able to eat ambiance or nostalgia but it sure feels good to bask in it when I’m there. My favorite touch on the menu is the teeny weenie sundae for $.99 – literally a condiment cup with fudge, ice cream, and whipped cream about the size of a golf ball. Perfect after those super-sized entrees. Oh, my gosh! I can’t believe I wrote that. I’ve rewritten that sentence to more accurately reflect the palatability of leftover pancakes. Thanks for setting me on the right path. I’ll give two halluces up to their Sloppy Joe con potato chips and pickle slice. While not putting down their shakes, I much…well exclusively…prefer the more drinkable kind of ice cream drink…The Frappe(e)…. which one might say is due to being somewhat aerated; any flavor is great, but coffee ice cream and syrup being my preference. Wonder if we could use one or two more “real” diners in The Q, but more in the traditional exterior style one can find using Google Images; there are still manufacturers. What? No pile-up? That is the best reason to go there! (And the shakes. Every time my husband has someone travel for business to ABQ he takes them there for shakes. And they always leave wanting more.) I, personally, die for a chocolate malt. Yummo! This is one of the few restaurants which Gil has reviewed which I might grade a tad higher. Probably a “20.” We have had unfailingly good lunches and good service in a great 50’s ambiance. We make it a point to eat here 3-4 times every year. Their chocolate malt is the best I have tasted in New Mexico since Fitzgerald’s closed down (many years ago). It is spoon thick with a rich malt flavor. On our visit last week we felt the patty melt, the Texas Annie special, the Southwest corn chowder (nice and piquant), cole slaw and onion rings were all very good to excellent. Only the French Fries let us down as they were served warm, rather than hot. And, as Gil writes, the green chile cheeseburger is consistently very good. On our trip from Houston, Tx. to Las Vegas, My wife and I along with my son and his wife stopped for lunch at the 66 Diner. Since we all watch the food channel, especially, Diners, Drive-ins, and Dives, My wife was determined to find a Diner for lunch. All four of us had something different and were very happy with our meal, service, and atmosphere. We have told all our friends and relatives about our experience at the 66 Diner. We will make it a point to stop there again. Our Thanks to the folks at the 66 Diner. Keep up the good work. Great review. They do whip up the best milkshakes ever.